It is the 13th straight victory for 'Madonna Japan' and their 4th straight World Title. MIYAZAKI, Japan – The Japanese Women’s Baseball National Team, “Madonna Japan”, completed a perfect run at the 2014 Women’s Baseball World Cup, defeating the United States, 3-0, in front of another big crowd of 14,500 fans at Sun Marine Stadium. The world championship victory caps off an impressive streak of 13 consecutive World Cup wins for Madonna Japan, dating back to 2012, and follow’s Australia’s bronze medal victory over Canada earlier Sunday. Japan’s Ayami Sato (Overall: 2-0, 0.00 ERA, 10 K, 0 BB) tossed a 7-inning, complete-game shutout to earn the win and honour of being named the 2014 World Cup “Most Valuable Player”. Japan was able to take advantage of two costly U.S. errors that resulted in two unearned runs in an otherwise very impressive outing by 17-year-old left-handed pitcher Sarah Hudek, who limited Japan’s fierce attack to just four hits over 6 innings, while issuing 4 walks. The U.S. Women’s National Team -- two-time former World Champions (2004 and 2006) -- did manage to outhit Japan, seven to four. 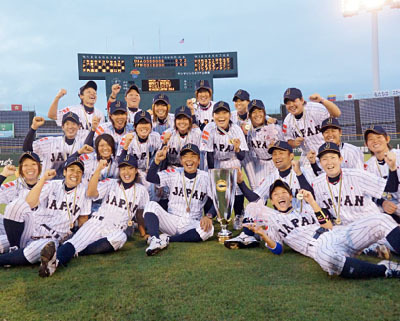 With the gold medal win, Japan has successfully defended their status as World Champions – a title that they first earned in 2008 and have never given back – and reinforced their position atop the IBAF World Rankings. Japan outscored their opponents 63-2 during the 2014 World Cup – batting .421 – and made just one error in 146 chances on defense. Canada was the only nation – of the eight in Miyazaki – to put up runs against the now four-time defending champions. The last time Japan lost was back on Sunday, August 12, 2012, when No. 2 USA knocked off the reigning world champions in an opening round-robin contest of the V Women’s Baseball World Cup in Edmonton, Canada. A total of twenty-four games were contested in Miyazaki for the VI Women’s Baseball World Cup, and included the eight nations of Australia, Canada, Chinese Taipei, Hong Kong, Japan, Netherlands, United States and Venezuela. The VII Women's Baseball World Cup will be celebrated in 2016 and hosted by another baseball-softball nation, South Korea, where the global women's baseball showcase will be expanded from eight to twelve participating nations to meet demand and growing global development in women's baseball. The Women's Baseball World Cup is the world's premier global platform for elite female baseball players and has been played every two years since the inauguration of the event in 2004.